This is my first Trish Doller book, and while I enjoyed it and thought it was a unique contemporary, I had a few problems with it. Although, I should probably say, it's more of a realistic fiction type of story than contemporary. This isn't a lighthearted contemporary; it's thought-provoking and real. That being said, there were a couple issues that I wished were different. First is the main character, Callie. I neither loved her nor hated her, but that's a bad thing - a character should always provoke an emotion in you, whether positive or negative. And that's my big problem with Callie: she's so passive. She just stands there and lets life happen to her. I know she's had a rough past and struggles with trusting her new family, but I just wanted some more emotion from her. I wanted her to make a decision for herself and actually make an effort to care about her family. By the end of the novel, I felt like none of her problems had been resolved. She didn't have enough character growth. Second is the romance. Sadly, I didn't really feel the chemistry between Callie and Alex. Callie is not the type of character to fall in love easily, so I definitely didn't feel like she was in love with Alex. Their relationship started way too fast and didn't seem very in-character for Callie. After all, if she was willing to make time to be with Alex (who is basically a stranger to her), why couldn't she make more time for her family (who are also strangers to her)? But aside from these two issues, I really did enjoy Where the Stars Still Shine (seriously amazing title, by the way!). It's a unique concept for a contemporary/realistic fiction story, and it has some truly fantastic minor characters. I completely fell in love with Callie's family. I loved her poor dad, who doesn't know how to deal with a teenage daughter but is doing his best to love her in his own way. And I loved the complex stepmother and Callie's sweet little stepbrothers. The way Trish Doller writes these relationships and bonds between Callie's family is so, so touching. And the writing is great, it flowed very well and despite not always liking Callie, I kept turning the pages to find out what would happen next. 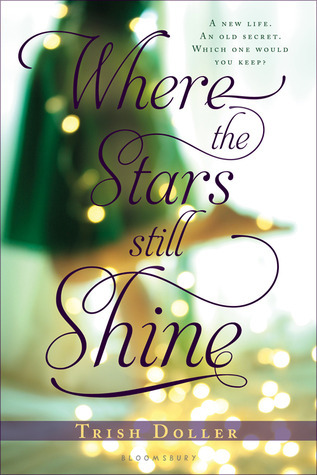 While I didn't totally love Where the Stars Still Shine, I predict it will be perfect for fans of gritty realistic fiction. I can see other people loving the complexity of Callie's character and her trust issues, even though it was a problem for me. Overall, Trish Doller is definitely a talented contemporary writer, and I'll have to try her first novel sometime.